Add the dramatic look of stonework to your yard with the Gardeneer Stonewall Faux Stone Border Edge. 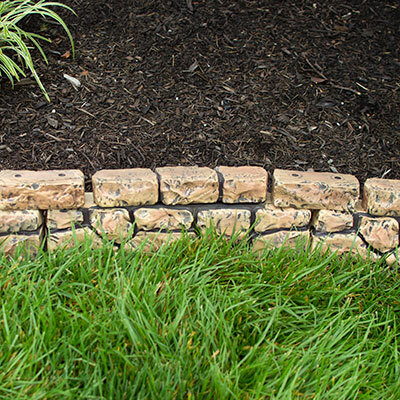 This edging enhances the natural appeal of your garden, without the weight or hassle of real stone. The tan color and black accents blend with your mulch, while the uneven, textured finish furthers the stone effect. This versatile border easily surrounds your flowerbeds, and its innovative interlocking design keeps it secure. The dual-level base pieces create a solid foundation for the edging, and the smaller top sections add height. Insert the tabs of the top sections into the slots on the base sections to connect the items together. Shorter bridge pieces have holes in them, aligning with the holes on the base segments. The included 9.5" long metal nails insert through both of these holes, keeping the item anchored to the ground inconspicuously. Shorten the bridge pieces or arrange them at an angle to create corners and curves on this truly customizable border. Each plastic section stands 6" high when assembled, and the entire fencing covers up to 9.75 linear feet. Create a natural looking border in your garden with this Stonewall Faux Stone Border Edge. Note: As the finish is hand applied, individual items may vary.